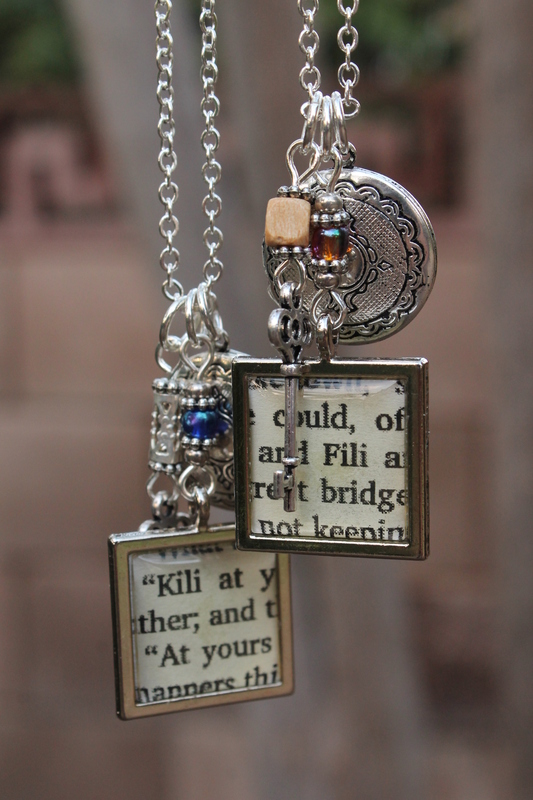 With the recent release of Peter Jackson’s The Hobbit: The Battle of the Five Armies (and my anticipation leading up to it), I’ve been inspired to create pieces of jewelry that in some way reflect characters from the movies. 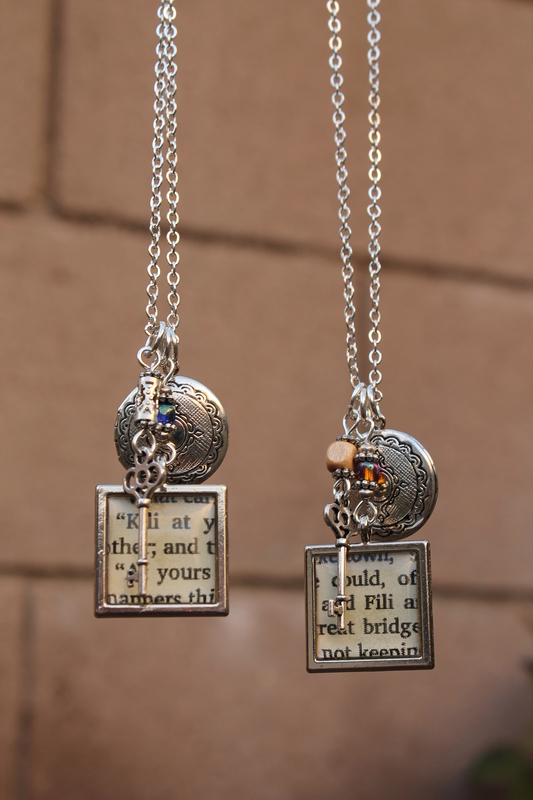 For this project, I went with my sister’s and my favorite characters, Fili and Kili. 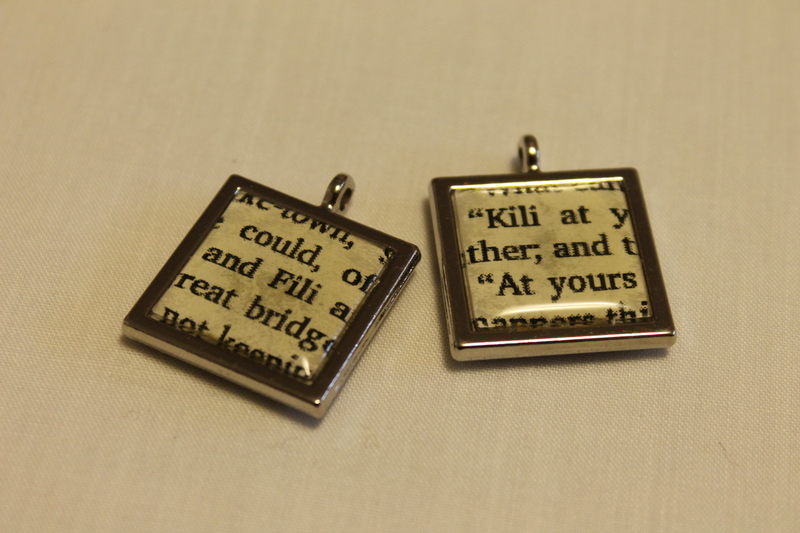 Since the dwarf brothers demonstrate such strong familial love, it seemed appropriate to celebrate the special bond between me and my sister with Fili- and Kili-themed friendship necklaces. Of course the design can be tailored to fit any theme that you and your friend share in common. Get creative! I’d love to hear what you all come up with. 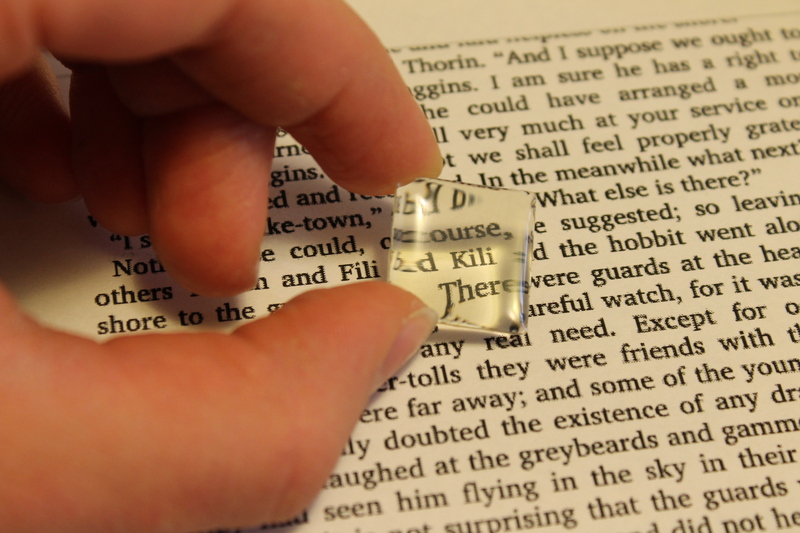 Step 1 — Choose what text you want to showcase in the bubble charms (I just went to Google Books, took screenshots of some Hobbit pages, and printed them out). Step 2 — Adhere a bubble cap to the selected text. Press it firmly and rub gently to eliminate air pockets. 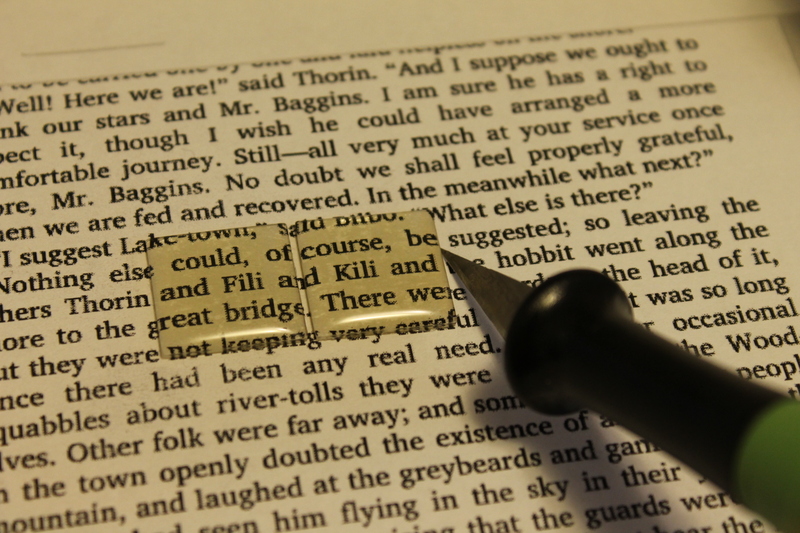 Step 3 — Using the X-ACTO® knife and cutting mat, slice around the edge of the bubble cap to free it from the remaining text. Step 4 — Repeat steps 2 and 3 with the other three bubble caps. Step 5 — With the toothpick, rub a tiny amount of rubber cement onto the back of each bubble cap. Glue the caps to the front and back of the square metal charms. 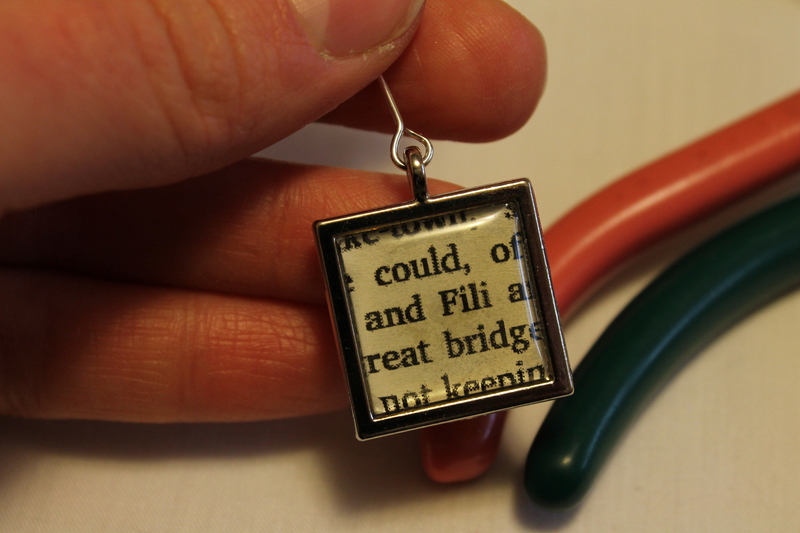 The following directions are for the Fili necklace, since that’s the one I made first. Step 6 — Trim the flat heads off a head pin with the side cutter pliers. Bend one end of the wire into a loop with the round nose pliers, leaving it partially open. – The reason I didn’t use pre-looped head pins was because I wanted to control how large I made my loops. – If you’ve never made a loop like this before, Blue Moon Beads offers a simple illustrated tutorial here. 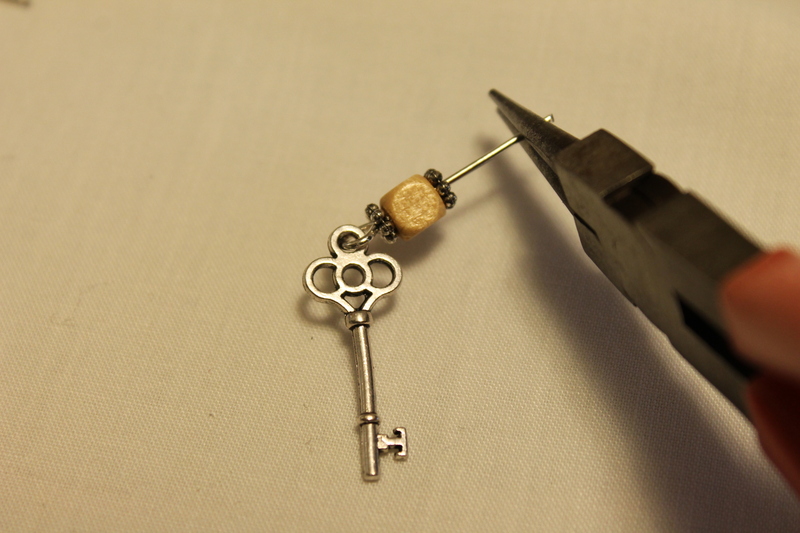 Step 7 — Insert the looped end of the head pin into the square metal charm’s connecting ring. Close the wire loop the rest of the way. Step 8 — Add beads to the head pin in this order: round spacer bead, spacer flower, amber glass bead, spacer flower, round spacer bead. Step 9 — Bend the remaining wire into a loop like the other end. Trim excess wire. Step 10 — Repeat steps 6-9 for the key charm. The bead sequence in step 8 will be a little different: spacer flower, wood bead, spacer flower. Step 11 — Connect the bubble charm, the key charm, and the locket to the chain necklace with jump rings. Done! Step 12 — Now you’re ready to repeat steps 6-11 for the Kili necklace. In step 8 substitute the blue glass bead for the amber one, and in step 10 use the decorative cylinder spacer instead of the wood bead. – *Tip: I stacked the two leftover round silver spacer beads inside my decorative cylinder spacer to keep it from sliding around on the wire.